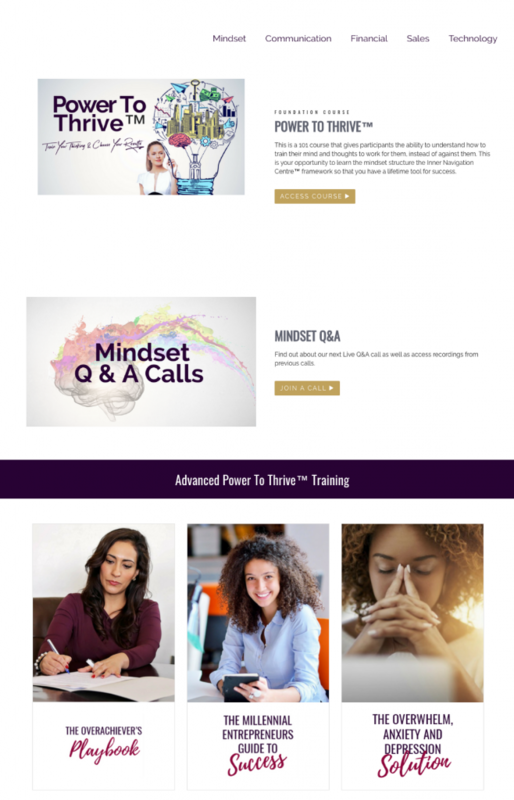 Power To Thrive™ is not just another same-old mindset course – it is an easy-to-use, totally new and unique, fun-filled and deeply satisfying tool that once learned will provide you a lifetime of confidence, happiness, and fulfillment. Imagine having the ability to focus on one thing at a time. You’re at your desk and you’re clear on what you need to do and effortlessly you’re banging through your to-do list like a superstar. All those things you’ve been carrying over day-to-day, week-to-week, month-to-month are literally getting done and you’re excited and happy because you finally feel successful. When you use the tools in the Power To Thrive™ you’ll have what you’ll need to completely change how you show up personally and professionally. You’ll discover how to pivot, regardless of what’s happening around you, so you can truly believe in yourself, knowing that you can turn the otherwise deemed ‘impossible’ into your reality. Imagine finally understanding the capacity you have and be able to harness it daily. What ripple effect would you be creating in your family? Community? Nationally? You already feel that if you could clone yourself, you’d be unstoppable but when you’ve energized your capacity you won’t feel like you need that clone anymore because you’ll be making it happen. You’ve had a lifetime of ups and downs yet up until now you’ve been pretty great at figuring out how to make it to the otherside … all of the sudden you’re doubting if you’ll have the energy and the faith to keep going. 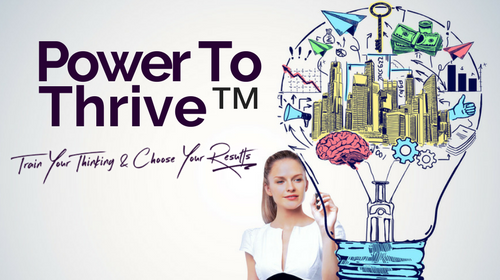 When you learn the tools in Power To Thrive™ you’ll activate your creative brain centers, increasing your energy and your personal ‘well of resilience’ so that you can quickly and easily tap into your strength, trust and optimism. When you use these tools, you’ll always have access to ‘your edge’ needed to find solutions…even when situations seem challenging or dire you’ll be able to figure it out. When you learn the tools within the Power To Thrive™ mindset training you’ll have your own personal recipe to freedom. If you’ve been doing all the gratitude tools and waiting for the abundance to flow in…but it’s not…likely it’s because you’re doing the ‘work’ but not feeling a connection to it. For your life to change, you can’t just imagine it or think it into reality – that’s what is being taught in most programs and it doesn’t work. In Power To Thrive™ you’ll instead learn the tools to feel your life, feel the power of gratitude and literally begin changing your DNA to align with abundance and your potential. It’s common to talk about how hard it is for women trying to ‘be it all’ and ‘do it all’. The mindset that we have to shoulder all the responsibility, both personally and professionally, feeling the judgement and shame if it’s not perfect – it’s taking women out all over the place. No matter what you’re faced with – using the Inner Navigation Centre™ you can be ready. It’s pre-training your brain and body for to reach success. Factor in that it’s a mindset tool where forgiveness can occur, where healing happens, and where you leave behind the story of your past so that your success story can surface and there’s no reason for you not to take this! GET WHAT YOU DESERVE SALE! Take a sneak peek inside our beautiful Tribe Thrive Training Centre! 8 Video Training Modules so you can watch at your own pace, on your own time and when it’s convenient for you. Specific downloadable Mp3 files so you can listen on the go on your mobile device at any time of day, especially in the moments that you’re struggling. You’ll receive ‘open access’ to previously recorded group calls in case you can’t be there live. Increase your productivity without having to do more. Access to our trainers who are here to mentor you and help you move forward so that you never again feel alone or stuck and you always have access to support. I love the Inner Navigation System™, the foundation of the Power To Thrive™ training! Sometimes after using it, my relationships change immediately! This seems to work instantly and I totally love it. I can also easily see how it would help me show my clients how to play and manifest in their life in a very cool and fun way. Power To Thrive™ training can be helpful in many many businesses. I can see people using it for manifesting goals, developing team, enhancing management communication, realizing goals for non-profits, and so many more options! The Inner Navigation Centre™ is a very original and cool concept! It can help people to transform their lives and businesses in a deep and profound way with lasting success. YOU MIGHT BE WONDERING... "What's involved in this training?" My goals in learning Power To Thrive™ were to learn how to focus, how to set attainable goals and take action steps towards them instead of getting locked into overwhelm because of fear or negative beliefs. It was a tall order. I loved every second. I loved the real life examples and I learned a ton from the Question and Answer calls. I wouldn’t change anything – I’m thrilled I opted in to work with a Mindset Ambassador. Private sessions were incredible! This body of work has truly changed my life. Join by midnight on December 3rd for our “GET WHAT YOU DESERVE SALE” and receive SIGNIFICANT SAVINGS!!! Did you miss one of our Exclusive Training Videos where we talked about what Prolific Mindset is and how it completely changes your life? We’ve covered significant ground revealing the FREE Prolific Mindset Blueprint. What we’ve seen from client results, is that the next best step is to take our foundational training in the Power To Thrive™. Why? Consider the last book you read in personal or professional development, what have you implemented from that book yet? Or the last workshop you attended how much have you put into practice? The content you take away is great but usually most struggle with embodiment and implementation. Often that happens because you don’t have the right tools or support to help you continue your best path forward.